So when it rains, people come out especially to watch. Just the rain. They will pull up chairs in their porch and sit, as my parents do, and their six month old grand daughter is brought out too. The wonder and solemn silence with which she sits in the lap and stares out at the clouded sky shows she is aware of its difference, aware of the glistening rain drops having their fall broken by outstretched leaves, parched from the scorching 42C sun that burns down every day and will probably do the same tomorrow. Monsoon season is a crazy season, brought to crazy people, from a humid, hot still spell it will very suddenly change to cool wind and rain, then just as suddenly go back to scorching sun. It rains, so it is time for rainfood. Menus are changed, quickly whipped up. Lahore loves it food deep fried, and now is the time to have hot oily food that you simply cannot want to eat in the heat otherwise. Every vendor knows it is the time for samosas and pakoras, every household knows it, and somewhere people will even make curry out of gramflour and drop in pakoras – and a university community will troop in to eat, facing the windows as they do. Tea is a common addiction, every couple of hours on the hottest days,but today it is cradled as if it were a rare treat. It rains, and people leave their work to gather outside under a dripping veranda . They will watch the ground, they will watch any one who is out in it. Lahoris will always look amused at umbrellas when they see one, despite legendary fierce sunshine and despite the crazy monsoon rain that comes down like a white unrelenting sheet, they still consider them as eccentric pieces depicting an unnecessary fuss. And even if all there is opposite is a building, today they see and feel. People who otherwise succumb to the mundane without a thought, never changing their routine or adding something new, will somehow for an hour, for as long as it rains, wake up. They will suddenly smell the earth, the rain, they will suddenly be grateful for every scent of steaming food and wet earth. They will suddenly be spontaneous, and they will suddenly feel, and take a walk in the rain, laugh with delight when they get soaked after a ‘necessary’ few steps to get from A to B,and then brandish their damp clothes like armour, or put out their hands gingerly and draw them back in to examine the rain-drop on their palm. They will suddenly see, and look at the silent trees around them that commanded attention but got none before, and beauty in leaves that are shades greener with the dust washed off of them. Yes, that is it. One of the most polluted cities will have its dust beaten down by heaven-sent crystals, and the skies, those purple-grey cloudy skies seem clear and beautiful. Even the traditional red brick buildings of college buildings are beautiful to look at, for they turn a deep red when wet, and send out an earthy smell of bricks that remind you of things as you pass by. They will even get all romantic and imagine new scents. Yes there is a mess of mud and traffic, children swimming in roads flooded because the gutters do not work without a care of contamination, wild boys jumping into the muddy canal running through the city just so they can swim in the rain, but people generally love rain here. Lahoris feel sorry for those who cannot enjoy rain, those who have come from climates where it rains all the time, they feel sorry for them having to miss out on the ‘seeing’ and pleasure that comes with rain and changes the feel of an everyday, changes moods, and they also feel sorry for them having to live with rain as an almost daily occurence. For you see, much as Lahoris love their rain, they don’t want it everyday. And much as they love to complain about their sun, they would rather have it everyday. 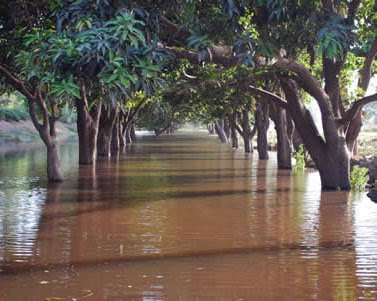 Above Pic featured by Daily Times: Lahore: A green belt near the canal inundated with rain water. It is so wonderful to enjoy the rain!! I always find it funny that so many of my countrymen seem to run from it! Such a lovely description of rain. Thank you!